This story is just breaking and deserves a special mention. Buried in the thick woods of northern Warren County, 2 miles from the nearest road, was a testament to human adaptability. A tarp-covered lean-to loaded with clothing, sleeping bags and provisions — items believed to have been stolen from seasonal homes around the Brant Lake region — was his residence, at least for the last several months. The man police believe endured the elements of the Adirondacks in a pine-branch shelter was Alan G. Como, 56, whose last known address was in Massachusetts, police said. He told police he’d lived in the woods for the past 20 years. This guy had been breaking in and burglarizing camps for gear – for 20 years!! Seems he started near Chazy Lake and began moving south after he was detected. Big and muscular with little fat on his body, police said he is in remarkably good shape for someone his age who has apparently lived in the woods for at least several years. “He’s a pro. He knows what he’s doing,” Cleveland said. Only items needed for survival — clothes, sleeping bags, food and batteries — were taken during the burglaries, with the thief leaving behind valuables like jewelry and electronics, the sheriff said. For over a year, Warren County Sheriffs Deputies and State Police have been looking for a man living in camps in the middle of the woods, stealing items here and there from camps in northern Warren County. “A lot of people seen him and whatnot, but they just weren’t able to catch up to him,” says Paul Smith, with the Horicon Highway Department. Until Wednesday, the arrest of 59-year-old Alan Como came on the heels of a Tuesday morning tip from two Horicon snowplow operators who saw something that just did not look right. “2:30 in the morning, somebody is out on a bicycle and there is two-inches of snow on the road…something is going on,” says Mark Younes, with the Horicon Highway Department. There was a bike trail in the snow that the plows followed along their route. The plow operator followed the tracks in the snow until they went over the snow bank and left the road. “They sent up some investigators…Mark and I went up to show them where he went over the bank, and they took it from there,” says Smith. After two days of scouring the woods, on Wednesday, deputies found Como’s latest campsite. “(It was) about two-miles in, way back in the deep woods…(we) spooked this guy out of his place,” says Warren County Sheriff Larry Cleveland. Then, a nearly two-mile foot chase ensued, until Como ran into uniformed officers waiting for him. I don’t know what to make of this. Sort of reminds me of famous Adirondack hermits of the past and even some people I know who live in “houses”. Look, I don’t support what this guy has done, but this story is sounding more like First Blood than a case-study in law-enforcement and prosecution. They are hitting him with a felony count based on the estimated value of a tree. We’re certainly not condoning a hermit’s theft of minor items from isolated camps. That’s a crime that should be punished. But the Beaver Pond Hermit case is a clear signal that if you choose to live outside the boundaries of mainstream society, you may find yourself a target for the police state. Como’s appearance in Horicon Town Court was brief Wednesday afternoon. Wearing a black-and-white jail jumpsuit and blue denim jacket, his legs and hands were bound with manacles and handcuffs. According to Cleveland, his department has access to your tax records, they know who your relatives are, if you hold any licenses, and your prior addresses – all pretty well expected, but they apparently have ANOTHER 20 PAGES of your life stored away somewhere as well. After three years — winters and all — in the rugged southern Adirondacks, Como, 56, has a new indoor home in Cell 21 of Pod C in the Warren County Jail. Here’s hoping Mr. Como will get out of jail soon, lift a good sleeping bag and a tent on his way out of town, and disappear into the woods again. 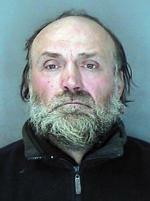 The woodsman … told State Police …he was living deep in the woods near Chazy Lake about two winters ago. … several local residents reported unusual camp break-ins where the thief took only basic household and clothing necessities, leaving behind items of substantial value. I would like to learn how to identify and prepare edible wild plants, start fires with a bow and make cordage from barks and herbaceous plants. Other skills like building shelter, container fabrication and snare setting would be cool to learn also. I will not lie when I tell you that all my stereotypical images of what a “drop-out” would look like were personified in the incarcerated visage of one Alan G. Como. Alan Como only had to find the right audience to become a legend like French Louie. Wrong time and place. Modern-day French Louie? Or a homeless guy with skills? After decades, relatives discover whereabouts of ‘Mountain Man’ – Gee, I wonder where this story came from? Thanks for reading Don. Can You Live Outside Society? – I like to stay on “the fringe”. Elusive Utah &apos;Mountain Man&apos; Captured, and here. To the commenter on Garrow. Sorry I found this Thread 2 years since the last post, and you’ll never see this. I was but a baby when he made camp on my Family’s Land. I heard stories of Him all my young life. If the damn Staties had let my Uncles go into the woods after him, they would drug him out feet first. Garrow was a Phsycho. No comparison to this man. Many Children went to bed in The Wells, Northville, Lake pleasant area fearing ‘ ol Garrow, from the strories we heard. This Man was hermit, he had survival skills. Just different from what you wankers see on Discovery channel. Took what he needed and no more. Let’s sum up where we have gone as a society. You can’t live in the woods and avoid people b/c squatting, trespassing and camping without a permit is illegal. Being homeless is vagrancy, begging for food is panhandling – another crime. Yet if you want to work you can’t b/c the government has allowed all our jobs to get shipped to Communist China. What jobs are left are given to J1 Visa Students & refugees from everywhere else b/c the government again give employers $1 an hour subsidy to hire them. Then we give amnesty to the illegals who take whatever is left. Life in the US is a no win situation for an American born unless you are privileged. This guy was wrong for entering houses, but they would have gone after him anyway b/c he did not conform to societies rules. I think that legal pragmatism needs to be practiced. No physical or ‘serious’ psychological harm was done to the victims or anyone else in the area, therefore the cost and the benefit of jailing this man is pointless. It seems to me that if he survived in the wild with only a few items stolen like clothing, tarp etc. he as is stated in the article is an ‘expert’ of and in the bush. With the information provided he may be able to provide invaluable information about changes in the forest during the last 20 years. If he wants to return and stay out of people’s way then let’s get behind him and provide him with the basics of life so he doesn’t have to b & e.